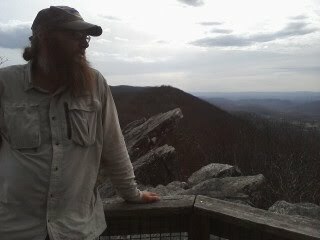 Hello from Hanging Rock Raptor Observatory! No picture can do this place justice - 360 degree views of what seems like all of Virginia and West Virginia! Today we left the Appalachian Trail and headed out onto the Allegheny Trail. 16 miles later, we have the best supper spot ever. Today on the ALT, Bart saw a mama bear and 2 cubs. Yesterday on the AT, I saw a red-spotted purple. I think we were equally excited. Huge thanks to the West Virginia Scenic Trails Association volunteers for the excellent blazing - I felt like we were following the yellow brick road to the Emerald City!